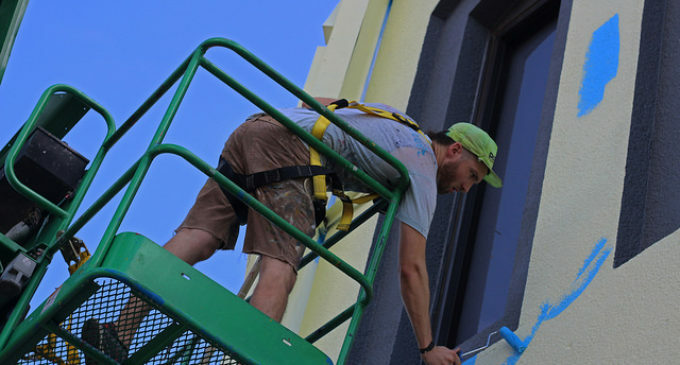 The Denton City Council is considering the removal of the mural painted above the entrance to Andy’s Bar, a music and bar venue located on the Denton Square. Gerard Hudspeth, who sits on the city council representing District 1, started a Twitter poll on Dec. 4, asking people for their input on what should be done to the mural. The hearings are being held because the owner of the bar allegedlydid not follow the procedure for getting permission to have the mural painted. Because the bar is located on the Square, the mural must get approval by the Denton Historic Landmark Commission. “We’re going to leave it and make a decision after the design standard is in place, which should be in February,” Hudspeth said. The mural, painted by muralist Dan Black, depicts a bird flying over a the desert. Black painted the mural in October of this year and has painted other murals around the city. People have replied to Hudspeth’s poll tweet with a variety of reactions. The owner of Andy’s Bar is appealing to city council because the Denton Historic Landmark Commission had not approved another mural that was painted on the building. Should have used a doodle poll, much more inclusive than twitter. This is the kind of stuff that doesn’t seem like a big deal but is truly quite frustrating. These exclusive voting/commenting procedures where a person must have a Twitter or Facebook to take part limit the participation of others in the community who don’t want to support these types of platforms.